Sign up for a life-altering experience of this 15-day tour that takes you through Vietnam, Laos and Cambodia. You will explore some of the most stunning temples in the world, learn about local life, culture and rituals, be a witness to stunning landscapes and natural wonders as well as discover the art and architecture at the places of your visit. Several road trips, boat trips, scenic flights and cruises later, you will return with a bag full of memories. You will spend this day exploring the legendary Cu Chi tunnels, symbolic of the tenacity of the Vietnamese people and associated with war history of the country. Just about 1.5 hours of drive from the Ho Chi Minh City, the tunnels spread for over 250 kilometres. You’ll be surprised to know that the tunnels, boasting an entire network of trapdoors, constructed living areas, storage facilities, weapon factories, field hospitals, command centres and kitchens, were built during the French occupation of Vietnam in the 1940 using very basic tools. A documentary will be shown to all visitors at the beginning of their tour. This will be followed by a thorough tour of the tunnels. At the end of the tour, guests will be offered khoai mi luoc (boiled cassava), a traditional Vietnamese dish eaten daily during the war. 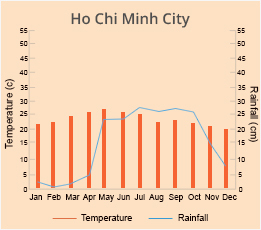 Following your return to the Ho Chi Minh City set out on exploration of the city. Make stops at the Reunification Palace, Notre-Dame Cathedral as well as the Dong Khoi Street and admire architecture from the colonial era. Overnight stay at a local hotel in Ho Chi Minh City. Leave Ho Chi Minh City for the picturesque little province of Ben Tre in the Mekong Delta, right in the morning. 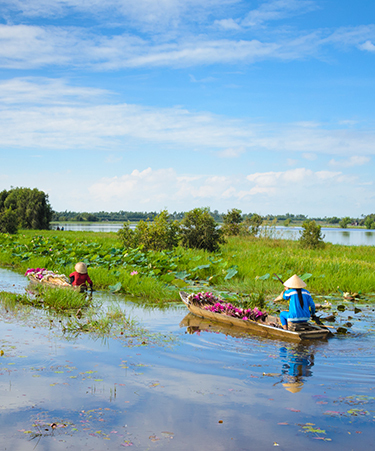 Thanks to its dense green rice paddies, the Mekong Delta has earned for itself the nickname of the ‘rice bowl’ of Vietnam. Visit a brick factory in Phong Nam where bricks are still made from hands. Next, cruise along the Chet Say River and make stops at local workshops in small villages, including a carpet-weaving workshop where you can try your hand at the activity too. Hop on to xe loi (a kind of motorized rickshaw) or a bicycle for a personal tour of the local traditional farms, rice fields and vegetable plants. Don’t forget to gorge on regional specialties, such as “elephant-ear fish” and freshwater shrimps. In the afternoon, board a sampan (a flat bottomed Chinese wooden boat) and explore the narrow canals of the Mekong Delta. 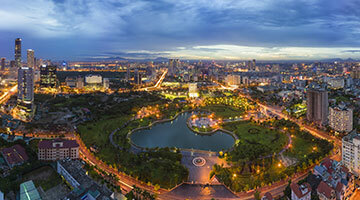 Travel back to the Ho Chi Minh City by car as your day’s exploration comes to an end. Overnight stay at a local hotel in Ho Chi Minh City. 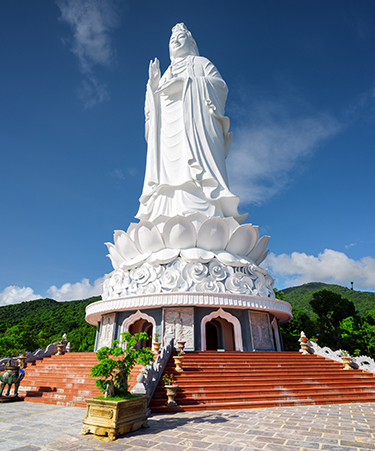 Spend the day at leisure till your transfer time (without a guide) for your flight to Danang. 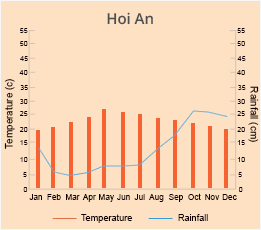 Meet with your local guide upon arrival and be transferred to a hotel in Hoi An. Spend the rest of the day leisure. 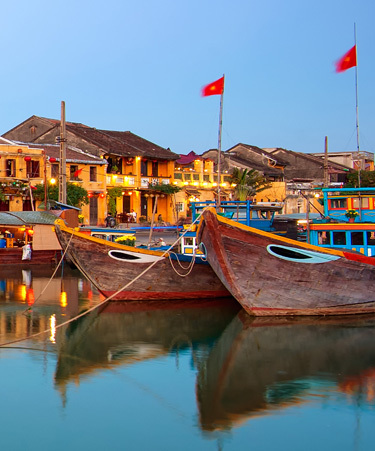 Take a walk to explore the ancient town of Hoi An, recognized by UNESCO as a World Heritage Site for its well-preserved century-old streets and houses. From here ride a bike to the village of Tra Que. The 30-minute ride will take you through picturesque countryside, marked by splendid rice fields and scenes of local life. Tra Que will leave an impression with its aromatic herbs and you can learn about the work and crafts of local people including planting and picking vegetables. You will be treated to local food specialities such as tam huu (small skewers of pork and prawns), various kinds of shrimps, pork and herbs among other popular dishes from the region. Return to Hoi An early in the afternoon. Stop for tea/coffee at ‘Reaching Out’, where all the waiters and waitresses are hearing impaired and are given a chance to make a living and feel included. Overnight stay at a local hotel. After a leisurely morning, depart Hoi An to reach Danang Airport (without guide) for the flight to Hanoi. You will be welcomed at the airport by your local guide and transferred to the city for hotel check-in. The balance of the day is at your leisure. 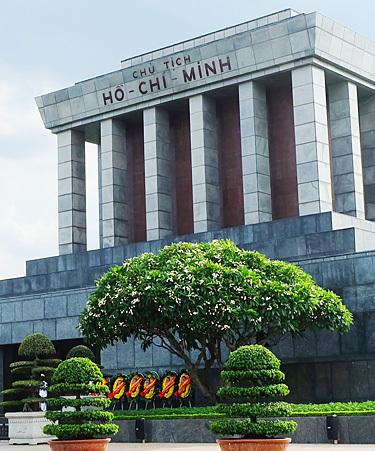 Begin you day’s exploration by visiting the Ho Chi Minh Mausoleum, the final resting place of Vietnamese Revolutionary leader Ho Chi Minh. The museum is inspired in architecture from Lenin’s Mausoleum in Moscow. The mausoleum remains closed on Mondays and Fridays. Next, visit the Vietnam Museum of Ethnology, featuring tribal art, artefacts and everyday objects belonging to different ethnic minorities in Vietnam. The museum represents as many as 54 ethnic groups across the country. Visit the Temple of Literature (Van Mieu in Vietnamese) next, boasting traditional Vietnamese architecture and dedicated to Vietnam’s finest scholars. End your day by visiting the Old Quarter and the surroundings of the Sword Lake. 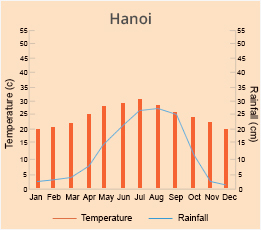 Overnight stay at a hotel in Hanoi. Start in the direction of Hai Phong early in the morning. 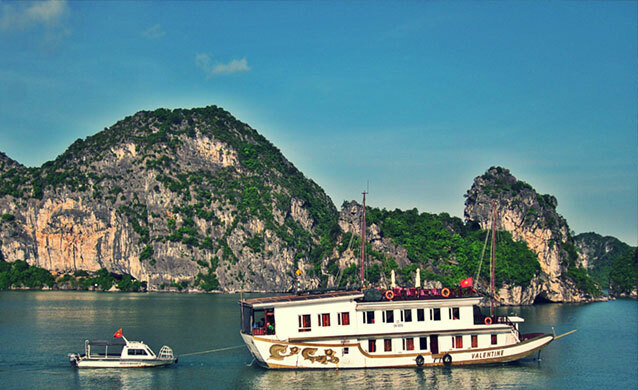 Upon arrival here towards the end of the morning, board the cruise to the Halong Bay, a UNESCO World Heritage Site, from Hai Phong (Dinh Vu Harbor). 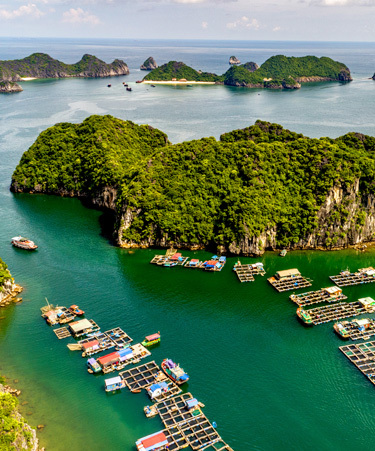 You will cross the stunning Cat Ba Island, Bai Tu Long Bay and Lan Ha Bay on your way to reach the Halong Bay. Spend overnight on the cruise. Go for an engaging Tai Cha class before breakfast and follow it up with a kayaking expedition. Later, return to Dinh Vu port in Hai Phong. Disembark towards the end of the morning and return to Hanoi. On the way be treated to stunning views of fields of the Red River Delta. 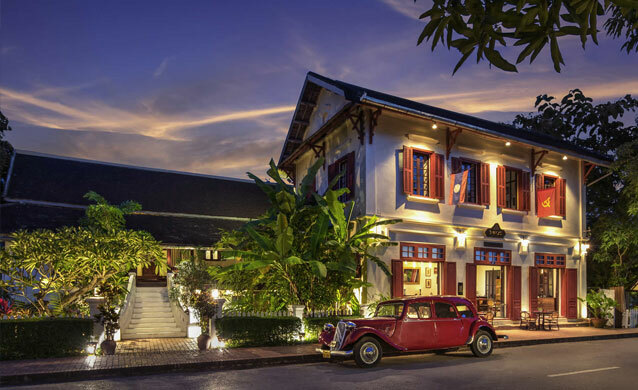 Be driven to the airport for your flight to Luang Prabang - a UNESCO Heritage City, and be transferred to your local city hotel. Spend the rest of the day at leisure. Sitting at the sacred confluence of the Mekong River and the Nam Khan, Luang Prabang awakens the spiritual side of visitors with its shining wats and saffron-clad monks. 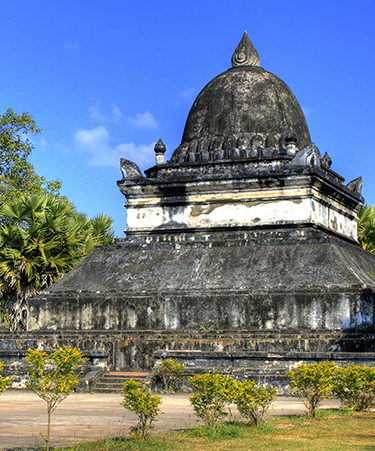 Spend the day exploring the beautiful and historical temples, including Vat Visoun (the oldest temple in the city) and the temples of Vat Xieng Thong and Vat Mai. Visit the summit of the Phousi Mountain for breathtaking vistas and feel the pulse of the city at the Hmong market. Take a motorboat to visit the Pak Ou caves; two popular caves in the limestone cliff boasting several Buddha images. 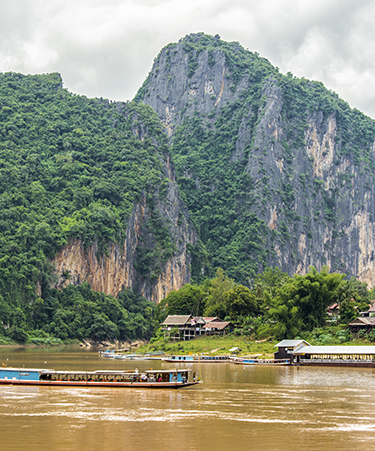 On your way to the caves, get a peek into the local life at the small villages along the Mekong River. 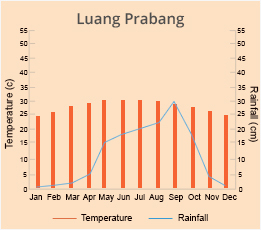 Travel back to Luang Prabang later in the day and spend the remainder of day at leisure. Travel with your guide to Vat Nong temple for the morning procession of monks at Tak Bath. The experience of seeing the locals kneeling down on the sidewalks to offer food to the monks without exchanging any word will be surreal. Later, visit the local market with your guide to experience the hustle and bustle of the morning. Have a delicious soup at a local restaurant by the Mekong River or just enjoy your cup of coffee while watching the locals engrossed in their daily lives. Next, you will visit the Royal Palace Museum, followed by a drive to the astounding Kuang Sy waterfalls, made up of limestone formations and boasting many turquoise-coloured water pools. You enjoy a bath at any of the pools or sit in the public park by the lower level of the falls for enjoying refreshing coolness of the region. 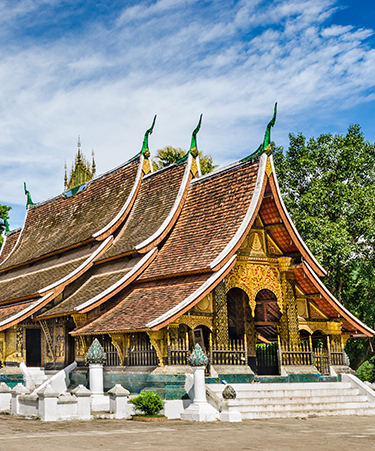 Travel back to Luang Prabang at the end of your tour. 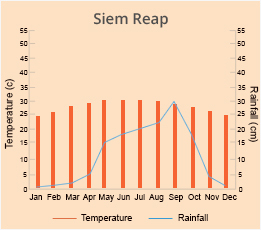 Spend the day at leisure till your transfer time (without a guide) for your flight to Siem Reap. Meet with your local guide upon arrival and be transferred to a local hotel. Spend the rest of the day leisure. 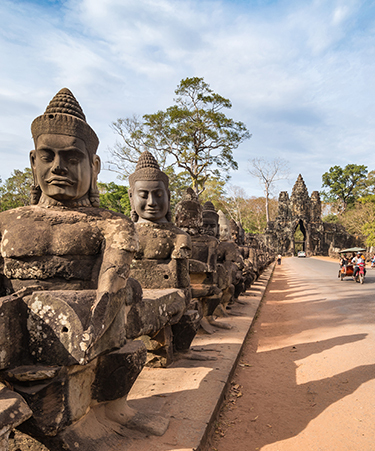 Start your morning by travelling on a scenic road, surrounded by trees as old as 100 years, to reach the majestic Angkor Thom, the last capital city of the Khmer empire. Explore the stunning Bayon Temple, built around 12th - 13th century and surrounded by 54 towers, each of them adorned with 4 faces. Make a stop at the Baphuon next, Located 200m northwest of Bayon and popular as the 'world's largest jigsaw puzzle'. Visit the Terrace of the Elephants and the Terrace of the Leper King next. 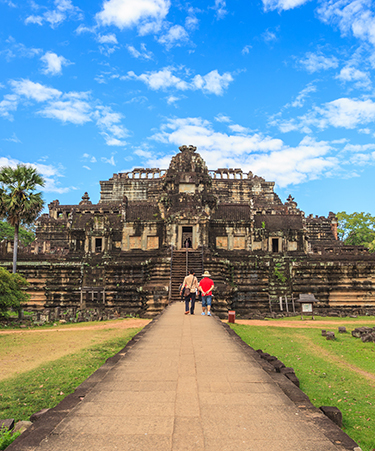 The former is 350 metre long reviewing stand, in a ruined temple complex, used by Angkor's king Jayavarman VII as a platform from which to view his victorious returning army while the latter was built in the 12th century and remains covered by magnificent Apsara sculpting. 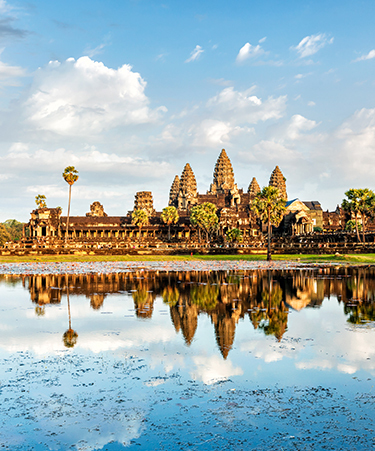 The afternoon is reserved for the most important visit to the phenomenal ruins of the temple of Angkor Wat, A UNESCO World Heritage Site that is the largest religious monument in the world. End the day by visiting Ta Prohm, popular for its Bayon style of architecture. Overnight stay at a hotel in Siem Reap. Leave for Kompong Khleang Floating Village in the morning and explore the local life there. Later, take a boat over the canals for reaching a lake where Vietnamese people are often forced to live because of weather-related displacement. Back in the village, have lunch at a local villager’s home. 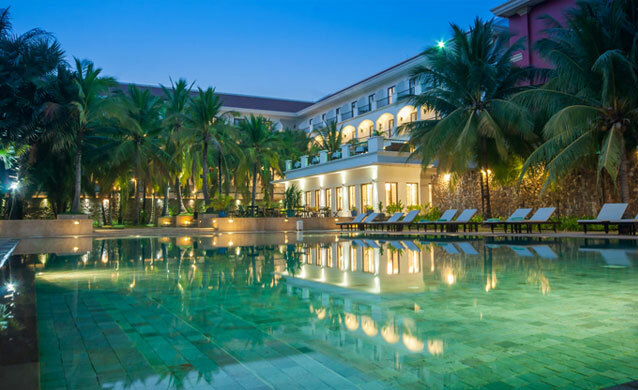 In the afternoon, return to your local hotel in Siem Reap. Spend the morning at leisure and transfer to the airport (without a guide) for your departure flight and onward travel arrangements. 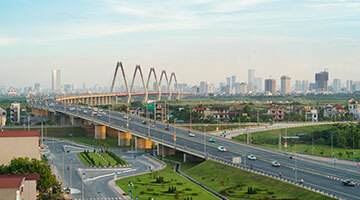 The Hotel approximately 25 minutes from Tan Son Nhat International Airport by car. It takes you just a short walk to the historical Saigon River and downtown. 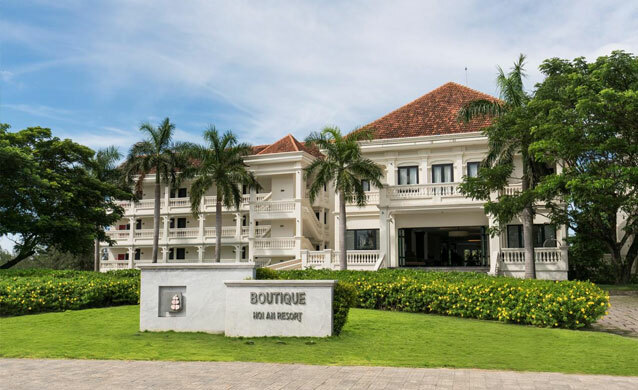 Boutique Hoi An Resort is ideally located on Cua Dai Beach, Vietnam. 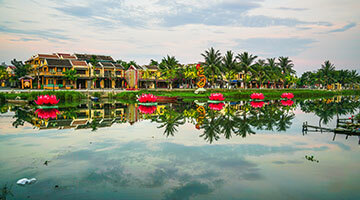 Resort is only 5 minutes from Hoi An centre, 35 minutes from the airport and 30 minutes from the town of Da Nang. 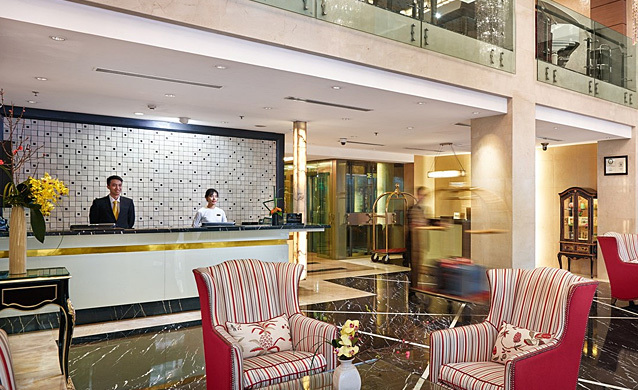 Located in the heart of Hanoi, this family-friendly hotel is within walking distance of Vietnamese National Tuong Theatre, Hoa Lo Prison Museum, and St. Joseph Cathedral. 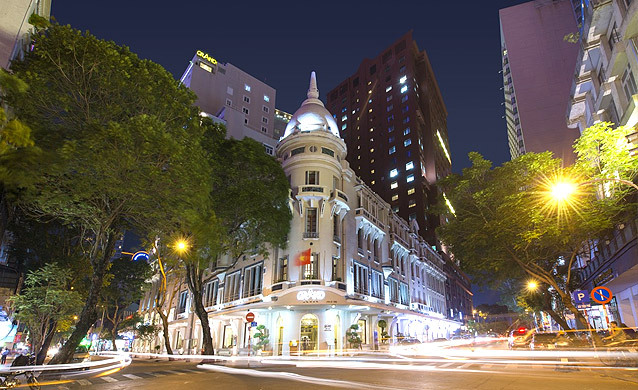 Also nearby are Hang Gai Street and Trang Tien Plaza. 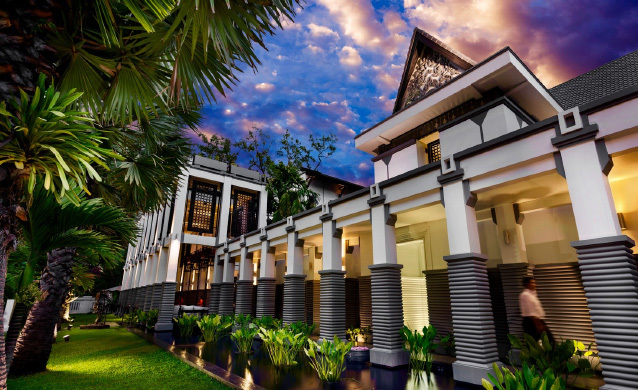 Located 3 kilometer from the Angkor National Museum and the lively nightlife on Pub Street, and 9 kilometer from the iconic Angkor Wat temple complex. 5 minute drive to the center of the World Heritage Hoi An Ancient Town & 30 minute to Danang International Airport from the resort. 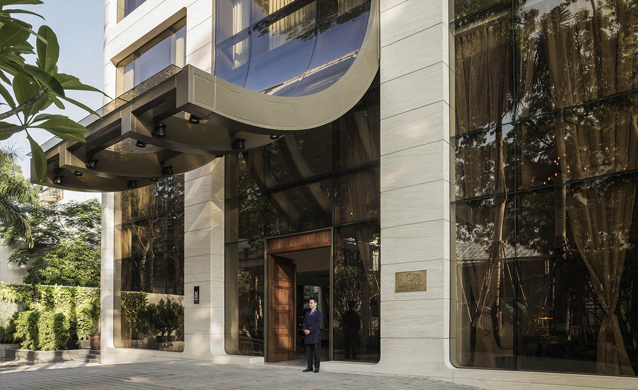 Located in the heart of Hanoi, the hotel is a walking distance to several city attractions, such as the Hanoi Opera House, the city’s Old Quarter, Hoan Kiem Lake and the Thang Long Water Puppet Theatre. 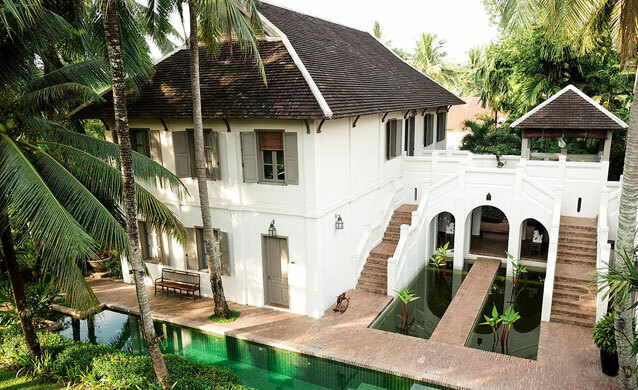 Satri House is located in the heart of Luang Prabang, This luxury hotel is within 2 kilometre of Wat Mai, Royal Palace, and Royal Palace Museum. Night Market and Phu Si are also within 3 kilometre. 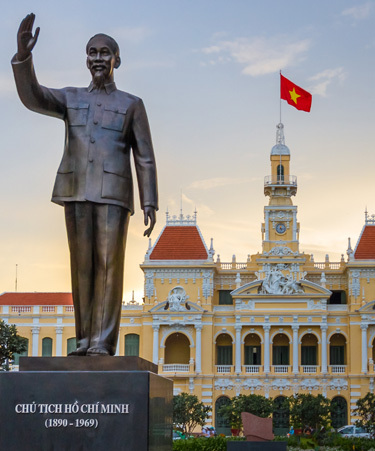 Flights from Ho Chi Minh City - Danang - Hoi An (Day 4), Hoi An - Danang – Hanoi (Day 6), Halong - Hanoi - Luang Prabang (Day 9) and Luang Prabang - Siem Reap (Day 12). Sightseeing as mentioned in the program. All local boat rental and cycling as mentioned in the program. Cruise 01 night on Non-private junk in Ha Long Bay. Entrance fees for visits mentioned in the program. The Mausoleum is closed on Monday and Friday. Every year, the monument remains closed between mid-September and mid-December for regular restoration and preservation of the presidential remains (exact dates to be checked each year). To be allowed to enter the mausoleum, you must cover your legs, stand in pairs in silence without crossing your arms or putting your hands in your pockets. The Ethnographic Museum is closed on Monday .